Although Prince pickleball paddles just came on the scene in 2018, anyone who has played tennis will be very familiar with this brand. Prince tennis has been making equipment since 1970 and also makes gear for other sports including badminton and racquetball. The first thing you’ll notice about the whole line of Prince paddles is the shape. 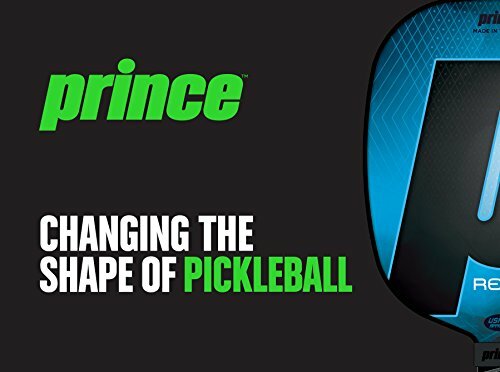 It’s really what sets their paddles apart from other brands on the market and is even their marketing tag line “Changing The Shape Of Pickleball”. So, is this just marketing hype or really game changing? While some players may dismiss the importance of the shape, others on the courts are calling it revolutionary -even a necessary change. If you look at other racket sports and the evolution of the gear in those sports, the new shape does make a lot of sense. Prince was an innovator in tennis and the Prince Classic aluminum racket was the first ever oversized head tennis racket. The Prince racket dramatically increased the size of the sweet spot and most tennis manufacturers followed suit, so Prince really did have a hand in changing the shape of the tennis racket and they hope to do the same in pickleball. 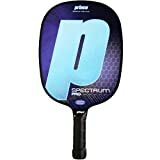 The first 4 Prince paddle models to launch are the Spectrum, Spectrum Pro, Response, Response Pro with rumors of a 5th “Quantum” paddle in the works. We’ve reviewed the two Pro models which are the first we’ve seen available and will update this page with any new Prince models that come out. The names of the paddles will sound familiar to most tennis players as they are reminiscent of the company’s tennis past, both of these (Response and Spectrum) are Price Tennis racket models. Pat Rafter used the Precision Response tennis racket to win back-to-back U.S. Open tournaments” in the late ’90s and the Prince Spectrum racket was also a popular selling line. But enough about tennis, we’re here to talk about pickleball! The first thing to know about these paddles is that they are actually made by Paddletek, the two brands formed a partnership to launch Prince Pickleball. Many of you probably already know about the company since they are a well-known pickleball brand, but if not you can read our Paddletek brand overview here for more information about the company and its paddles. The main things to know is that since 2010, they’ve grown to be one of the top pickleball brands, all their paddles are made in the USA, and they offer a 5-year guarantee against dead spots – which they also now include on Prince paddles as well. The first thing to clarify for you is that the Prince paddle models are almost identical, except for the paddle handle length. The Response Pro has a longer handle (5 ½” vs 5″) but other than that, the poly core, paddle length, width and weight options are the same. So the main buying decision, if you are considering Prince paddles, is the handle length. The main thing to consider is if you need the extra ½”. Players that have large hands or are used to playing a two-handed grip would want to get the Response Pro with the longer grip. 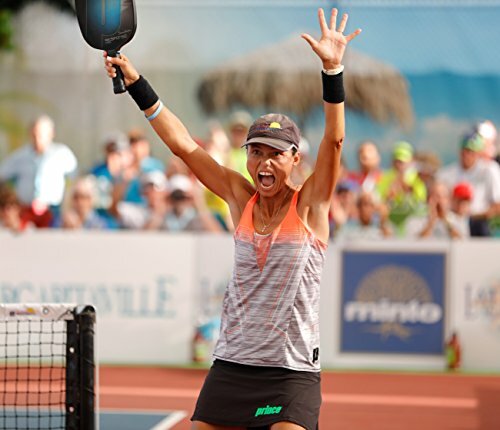 It’s relatively common to see players using the two-handed grip, especially former tennis players on their backhand but there are also professional pickleball players (including Simone Jardim) that often use it on their forehand. Two Weight options: both of these paddles come with a standard and light version. Top-ranked Simone Jardim used her Prince Response Pro at the 2018 US OPEN to win a Triple Crown, three gold medals in the three pro events. 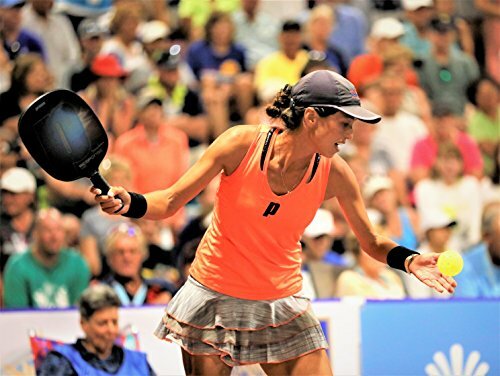 While she previously used ProLite paddles, and she helped design their SuperNova paddle), Simone Jardim is now the face of Prince pickleball. If you want to hear more about Prince Paddles and why she switched from the to the Prince Response Pro, there is a 40-minute interview here. However, I realize many of you won’t want to sit through the full interview so I’ve summarized the main takeaways. Shape: The main benefits she pointed out about the paddle are first and foremost the shape and large sweet spot. The “big sweet spot” has become a bit of a cliché in the industry, with almost all pickleball brands claiming to have a large sweet spot, however, the shape of these new paddles does seem to make a real difference. She and she points out the wear pattern on the face (worn from hitting the ball) is higher up than on other paddles she used in the past- meaning she’s been able to utilize more of the paddle surface rather than restricting her shots to the dead center sweet spot, like on other paddle shapes. Considering that she is a former tennis player and coach, it’s also not surprising she likes the racket-like shape. Thicker Core: In the interview, she also points out that the thicker poly core gives a great feel to the paddle and it transfers well – giving her the ability to drive hard passing shots past her opponents or pull back when less power is needed for drops and the short dink game. That’s essentially the idea behind the “progressive” poly core by Prince – that it efficiently transfers more or power depending on how hard you swing the paddle. Handle Length: She also points out that she plays with the Response Pro instead of the Spectrum Pro because of the longer handle, which makes sense given she uses a two-hand grip. Two Weight Options: One of the benefits of the Prince paddles is that they each come in two weight options (lightweight and standard, each with a corresponding grip circumference of either 4 1/8” or 4 3/8”). Another thing I thought was interested is that she plays with a custom weight made for her (8.4 oz vs. 7.7-8.1 on the standard weight Response Pro) and says she might even play with a heavier paddle (like some other pros do) but any more weight might cause to much stress on her shoulder that could lead to inflammation or injuries. Realistically, the minor difference in weight won’t be an issue for most recreational or even competitive players. However, at the professional level, they’re hitting the ball so hard (on their passing shots) that a few extra tenths of an ounce can make the difference in power. If you wanted a heavier paddle you could go with the standard weight Spectrum Pro (7.7-8.3 oz) if you’re willing to give up the extra half inch on the handle (if you don’t use a two-handed grip, the Spectrum handle is probably a good match for you anyway. If you want the longer handle, than the decision is simple- the Response Pro gives you the extra ½ inch. Before dropping $100+ on a new pickleball paddle, a lot of readers have asked what other brands to compare these to. I personally think this new core that Prince has developed, along with the thick X5 core on the Selkirk AMPED paddle line is setting the standard in the industry and could be the trend that we’ll see with other paddle makers. These thicker, more responsive core that excels at both power and control and moves the discussion beyond the graphite paddle vs. composite debate or having to decide between a power vs control pickleball paddle. If you’re on the fence with the Prince paddles, I would also take a look at Selkirk’s new AMPED paddles. The one key characteristic on Prince that sets it apart is the round shape, so if you’re coming from the tennis world or just like the round paddle this is probably a great match. However, if you’re looking for a slightly longer paddle (i.e. you have short arms, play singles pickleball or just like some extra reach) then you do have great options with the AMPED Omni or Invicta or Maxima. Selkirk also has the two weight options on their new paddles which helps make it easier to find the best match. The one problem with both of these paddle lines, for many readers, might be the sticker shock. With all these advances in materials and cutting-edge equipment design comes a price and both of these paddle lines are at the top of the price range. If you want to consider other brands, you could check out other new paddles that have been released on the market including some more affordable options. Prince was founded in 1970 by Robert H. McClure of Princeton, New Jersey (hence the company name “Prince”). In the early 70s Howard Head (see Head Pickleball Paddles) joined the company and later became chairman of Prince Manufacturing Inc. Interestingly, he was originally was drawn to the company after retirement from Head. Frustrated with their ball throwing machine, he attempted to improve the machine. Although he made some improvements, he found the small sweet-spot of his tennis racquet was a bigger problem and set out to solve it. In the end, he came up with a new design and pioneered what is now widely known as an oversized racquet. Prince was one of the first to use graphite. The company has changed ownership multiple times and also filed for bankruptcy protection in 2012. See more company history here. Now known as Prince Global Sports, LLC with headquarters in Atlanta, Georgia, Prince continues to make equipment for tennis, racquetball, squash and now pickleball.